This is an amazing new entry device that will be entering into the tablet space. It could give the iPad a run for it's money. Price and the success of Windows 8 will make all the difference. Here is a guest post from Jeddel Yeras from The College of New Jersey (with permission). Break on through... Surface. Last month the Redmond Giant, Microsoft, announced some details for its upcoming tablet offering called "Surface" and set the media in a frenzy of speculation as to whether this could be the long waited for "iPad Killer". Don't get me wrong, I've enjoyed Apple's products as much as the next guy, but frankly, I've grown somewhat tired of their market dominance and arrogance. Yes, the iPad is an excellent piece of hardware and there is no argument that iOS offers a plethora of applications. But do you really need that many apps? Is the iPad truly a versatile system that can revolutionize the computing industry and replace the PC? Arguably No. Microsoft has been patiently studying the market and analyzing its competition. The shortcomings of Android, and the success of Apple as well. It's response is what I would consider a truly "next generation" device that incorporates the option for both tablet as well as PC. Yep... You heard right. A tablet that can actually replace a notebook PC. Microsoft Surface will be offered in two variants a slimmed down version for the more "tablet-oriented" consumer dubbed "Surface RT" (code for "runtime") and a full featured version dubbed "Surface Pro" which will run the Windows 8 Pro Operating System. Pricing information is sketchy and rumors have a price range of $599-$999 but this is purely speculative as no formal announcement has been made by Microsoft on pricing structure for the much anticipated device. I personally do not own a tablet. I've played around with borrowed iPad's and didn't even bother to touch an Android tablet. I found the concept of a tablet interesting, but the functionality just wasn't there. They just seem like an overpriced electronic toy. Microsoft Surface, on the other hand, caught my interest. 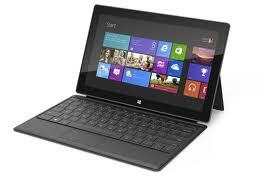 These machines will run Windows 8, carry a ClearType 10.6" HD display, configurable with up to 128GB of memory, runs Office Apps, and comes with a built-in keyboard that folds to a screen cover? I smell a winner! The perfect synergy of productivity and portability without skimping on the fun factor. Now this is a product that I would strongly consider investing in. Another unique aspect for this device, which strays from anything Microsoft has done in the past, is that the hardware and the software is all Microsoft. Whether that's a good thing or a bad thing is still to be determined, but it's a bold move by the company who previously was only interested in software distribution, leaving vendors to handle the hardware aspect. I can't decide which one will I buy if the iPad 3 of Apple or the upcoming Microsoft surface tablet pc, I love the portability of Ipad 3 and its processor and crispier shots using its 5megapixel camera but the specs of surface is really superb which I've read it uses Intel ivy bridge processor and a tegra 3 version. I have the iPad 2 and my wife has the iPad 2. I see no difference during normal use. The downside of both is that Flash video player does not work on the iPad which limits it's use for viewing video. This can be annoying. It's fine for email, reading, listening to music or viewing YouTube. I am hoping the Surface will not have this problem since it will run on Windows 8. The decision on iPad v Surface will ultimately boil down to "intended use". There is no argument that iOS has a plethora of applications available. Of the millions that Apple boasts in their catalogue how many of them will you actually use? Very likely not many unless you enjoy the many iterations of Angry Birds and the like. On that topic, the numbers Apple publishes are somewhat misleading when you take into account that multiple apps exist that do the exact same thing. So IMHO "millions" of apps can be somewhat misleading. In any event, the spec's on the Surface make it a formidable piece of hardware capable of (DISCLAIMER: for some individuals) replace the need for a notebook PC. What use would it have for a student? Take a moment to look at this: (http://vrge.co/OJN5Kc) I know I wish I had this type of technology when I was an undergrad.